These artist renderings are of equipment proposed for the EVERYbody Plays! inclusive playground at Melvin Miller Park, including early childhood equipment and equipment for children up to 12 years old. The Lawnview Board of Directors has launched a fundraising campaign – EVERYbody Plays! 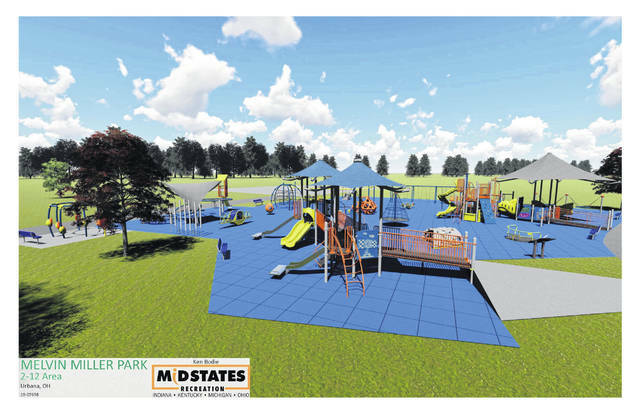 – to build an inclusive playground at Melvin Miller Park in Urbana to serve all children in the community, with or without disabilities. Inclusive playgrounds are designed to be used by children of all abilities – with mobility limitations, developmental and emotional disabilities, and no disabilities. “So, everybody can play together,” said Mary Kay Snyder, who is chairing the campaign for the Lawnview Board of Directors. Snyder is the information technology support and fiscal specialist for the Champaign County Board of Developmental Disabilities. Snyder and the EVERYbody Plays! campaign team has begun contacting local businesses and organizations and scheduling presentations about the inclusive playground. A variety of sponsorship levels is available for supporting the project, she said. Donations are tax deductible. Larger donors will have an opportunity for naming rights and to have plaques placed at the playground. – Purchasing laser-etched bricks that will become a permanent part of the playground site. Bricks are available in two sizes: 4-by-8-inch and 8-by-8-inch. Also, 12-by-12-inch bricks may be available later. – Dining at Texas Roadhouse in Springfield from 11 a.m. to 10 p.m. Sunday, April 28 – with 10 percent of your food purchase going to EVERYbody Plays! when you present a flier, printed or digital, available on the EVERYbody Plays! Inclusion Playground Project Facebook page. A raffle and T-shirt sale at Texas Roadhouse from noon to 4 p.m. will also support the cause. – Buying tickets to the 2 p.m. Sunday, July 14, Dayton Dragons game. Tickets cost $12, with $6 going to EVERYbody Plays! The city of Urbana is supporting the EVERYbody Plays! 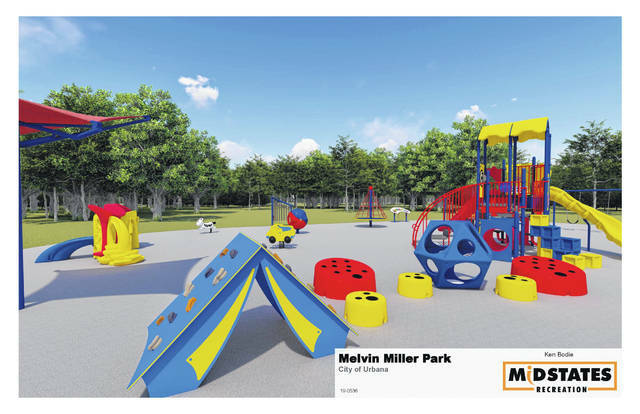 campaign by providing space at Melvin Miller Park for the inclusive playground, said Deb Aksenczuk, public works coordinator for the city. She said, “The inclusive playground will be a fun way to help children increase mobility and social interaction.” She and Snyder said that inclusive playgrounds promote brain development and help children reach developmental milestones, strengthen social skills and learn to respect people of all abilities. As Phase 1 of the inclusive play project at Melvin Miller Park, a 9-hole extension to the 18-hole Urbana Hilltop Disc Golf Course will be built this spring on flat ground behind the baseball and soccer fields. The extension will add new challenges to the course while being more accessible for senior citizens and people with disabilities, Aksenczuk said. The addition to the disc golf course is being made possible by a NatureWorks grant from the Ohio Department of Natural Resources and the volunteer work of community members. To make a donation for the EVERYbody Plays! playground or to learn more about the project, visit the EVERYbody Plays Inclusion Playground Project Facebook page or contact Snyder at 937-653-1775 or m.snyder@champaigncbdd.org. Submitted on behalf of the Lawnview Board of Directors.